Get certified with IYT and let the adventures begin! IYT Worldwide is a leading supplier of sail and powerboat skipper licenses. Through yacht training schools in over 45 countries the company issues Certificates of Competence and other safety and technical licenses for recreational sailors. IYT has spent the last five years focusing in on their production and internal process. In 2016 they came to Spincaster for a new website design to better address the demands of their members and visitors. They knew a priority was in serving their entire online audience better by providing easy access to essential information and by adding a quality experience for mobile and handheld devices. IYT World had a basic website that focused on their products and services. 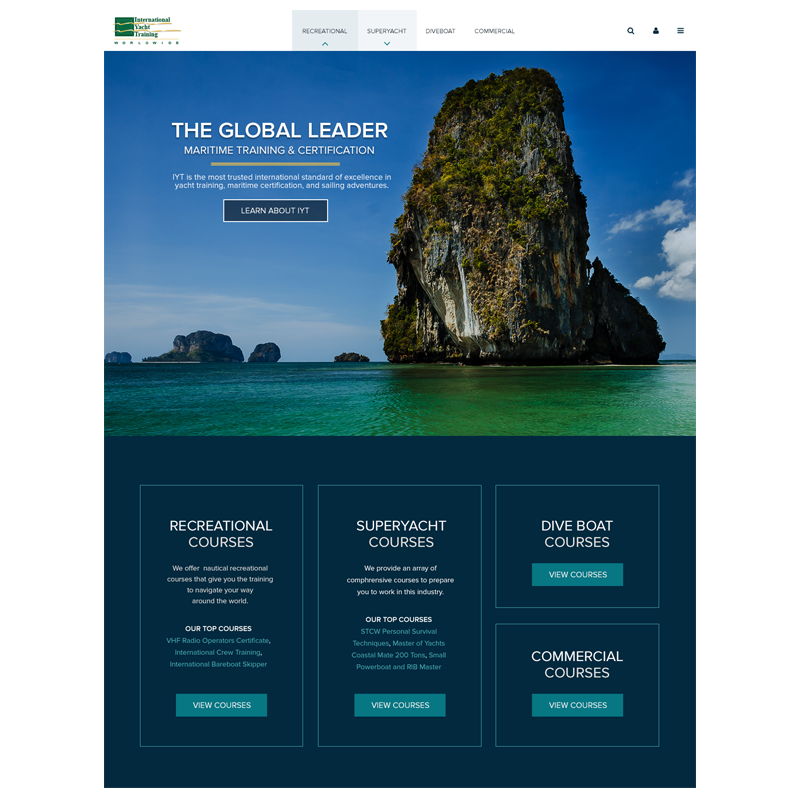 It was designed to simply inform the public on how to obtain a Certificate of Competence or another certificate for recreational yachting. 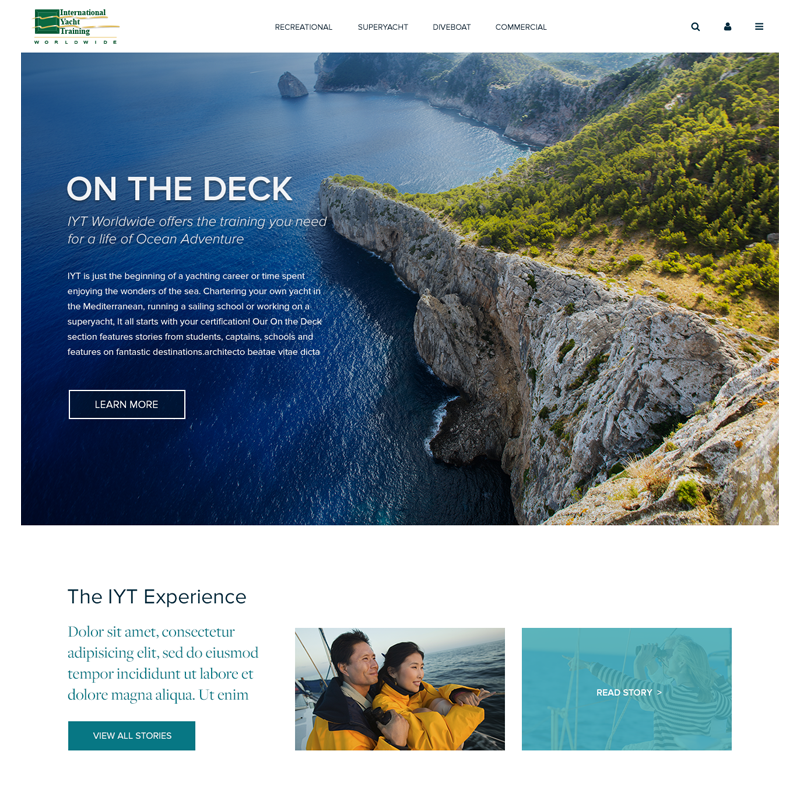 The brochure style site was not tailored to any one type of user but rather worked as a reference document for those already familiar with IYT. Commercial Business – Unique opportunities with Government and local authorities. The second priority for the new site was to play a key role in outbound content marketing. This included social media integration, direct distribution to existing members and the redistribution of new content out to various markets. Spincaster and IYT World began the process by reviewing the existing site content and then aligning this into new categories. The goal was to create a site design for mobile first as the majority of their users were not in an office environment but rather connecting via mobile networks. Much of the existing content needed to be revised and edited to become web friendly and to leave behind the textbook style formatting that had made the existing site difficult to read. New business driven priorities for IYT also had to be considered and the creation of three new sections was the result. Two specifically for the Diveboat and Commercial industries and a new “On the Deck” section for promotion, engagement, and marketing to the public. Once the Information Architecture for the site was established, a custom design for the new site was created. After approval by the client, construction began and the content revisions were undertaken. The new site features current techniques and design elements that align beautifully with the new objective of the site. As a marketing tool, the site directs each user into the section that they are most interested in and guides them through to key deliverables for IYT World. The site features a mobile navigation with quick access to pages in each section. Landing pages specific to each service area provide for strong SEO and page optimization. New post tools allow for proper categorization of articles for use in outbound marketing. The site also features a new Ecommerce section and Elearning section for a new series of Prep Courses that have been created for IYT World. Build in WordPress the solution has excellent editing and publishing tools in the CMS that also provide for proper permissions and controls. 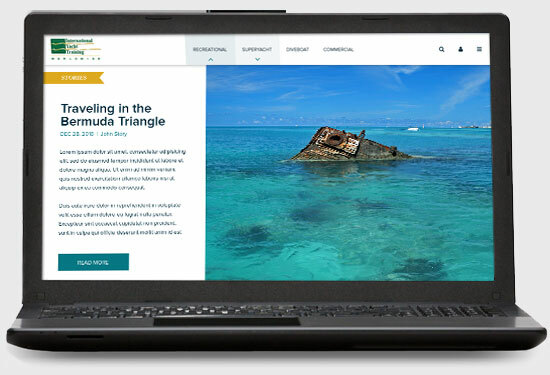 A key consideration for new marketing initiatives was to create a site that was visually appealing and lead the new visitor into stories and experiences that shared the Yacht lifestyle. This focus on Yacht culture that was not part of the old website and the new design needed to promote this content. With careful attention to design elements like fonts, images, layout details and user experience the new site features wonderful photography, strong calls to action and well-purposed user flow. We hope as new content is added the site will continue to support marketing campaigns, build awareness, provide valuable information to existing schools and instructors and connect effectively with students. We anticipate tremendous success for IYT World as they head into 2017 with a highly focused online presence.